The special effects clearly were the driving force in this movie. Most of them were pretty good, though I'm still scratching my head over the pygmy mummies. What were they doing there? I do like The Rock, who was pretty funny when he hosted "Saturday Night Live" in 2000 (I was in Los Angeles in April 2001 and saw him on the street; he is pretty much just as big as you might imagine), but was disappointed that he was only in the movie for a few minutes. But it was the special effects that provided the Bad Astronomy in the movie. If you've gotten this far you either saw the flick or don't care if I spoil it for you. That's okay, actually, because I can get to the astronomy without revealing the plot. That's good, because the plot was small enough that revealing anything more than an atom or two would give away the whole thing. The astronomy starts almost at the end. Our Heroes are running after the Bad Guys who have kidnapped their Precocious Kid. They are chasing them in... a dirigible (of course!). We see them flying across the full Moon. A few nights later, we see them flying across... the full Moon. The phase of the Moon is probably the single most abused astronomy idea in movies (besides sounds in space). The Moon goes through phases as it orbits the Earth. The phase changes every night, and the difference over even two nights is pretty clear. It's possible, just, that over three nights the Moon can be almost full, then full, then a little past full. But usually the Moon is very different over the course of that much time. Really, the phase should have changed quite a bit during the chase. At night, we clearly see the characters floating above the countryside, the full Moon and thousands of stars visible in the background. Actually, the full Moon is so bright that astronomical observatories split the month up into what they call "dark time" (when the Moon is either not up at night or a thin crescent) and "bright time" when the Moon is up most of the night. 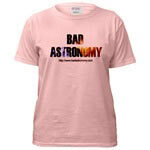 Astronomers looking for very faint objects try to get the dark time, and so of course there is heavy competition for it. Anyway, seeing stars in movies is a bit of a pet peeve of mine. It's rarely done correctly. In many shows, including "Star Trek", unfortunately, it is common to see stars out a window even if the room is brightly lit. This won't work very well! Even if the glare of inside lights reflected off the window doesn't swamp the stars, your eyes will be adjusted for the brightly lit room, and the stars will be almost invisible. Only the brightest stars will be visible, and the vast majority will be too faint to fight such luminance. This sort of thing crops up in commercials, movies and TV shows. It isn't accurate, sure, but more than that it doesn't look right. You can tell the image is faked, like when they use reflectors to make someone lit from the wrong side in a sunset scene. You may not be able to figure out what's wrong, but your brain knows it's wrong. In the nearly final climax of the movie (the movie climaxes a lot) Our Hero Rick O'Connell must get his Precocious Kid into the Golden Pyramid before the rising Sun touches him, or else his Precocious Kid will get a free ride to the Underworld. 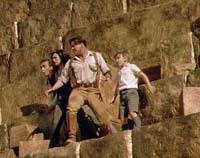 Running, O'Connell carries his Precocious Kid towards the pyramid. We see the light of the rising Sun as a line across the movie screen, sweeping after Our Hero, and he barely is able to outrun it and jump into the pyramid saving, his Precocious Kid. The line that divides day and night is called the "terminator". That line appears to sweep across the Earth because the Earth rotates. Since the Earth rotates once every 24 hours, the ground speed of the terminator is about 1600 kilometers per hour (1000 miles per hour) at the equator, which is roughly where this movie takes place. You might think then that the movie got this wrong by having the shadow line move at perhaps 15 or 20 kph. However, what we are seeing is not the terminator line. The scene takes place in a valley surrounded by mountains. What we are seeing is actually the shadow of the mountains moving across the ground. This is a subtle but crucial difference. The speed of the shadow of an object depends on how fast the Sun is moving across the sky, how tall the object is that casts the shadow, and how high up the Sun is. Think about it. At sunset, the shadows appear to move pretty fast, and in a few minutes you can see them lengthen appreciably. My own shadow can lengthen by as much as 10 meters in 20 minutes. At noon though, when shadows are short, in an hour it only grows a fraction that much. I'll note that Major Film Critic Roger Ebert (whom I'll note I actually like a lot, and I'll also note we agreed about liking Red Planet) made this same mistake in his review of this movie; he assumed the line was the day/night terminator and said the line wasn't moving quickly enough. Ironically, if anything the line is moving a bit too fast. But wait! We're not done. Our Hero is carrying his PK west, away from the rising Sun to the east. As the Sun rises, it lights up tall objects first and the light works its way down as the Sun rises. So instead of seeing the shadow line moving along behind Our Hero, he should actually see it light up the top of the pyramid and move down like a closing dungeon door on the base of the pyramid. So the movie still had it backwards. They would have had it right had the Sun been setting, but not rising. Like I said, the movie was fun, though it could have been better. The Bad Astronomy in it was minor. Of course, when you are dealing with mummies, armies of the undead, magic bracelets and reincarnation, all scientific bets are off. Maybe the Mummy III will have better astronomy, if it has any at all. And if you think they won't make a second sequel after this one made $70 million opening weekend, maybe you need to have your brain placed in a canopic jar. Do you dare read about the Mummy's Curse?